My new home doesn’t meet. The cabinets don’t meet the walls. The walls don’t meet the floor. The floor doesn’t meet the foundation. The locks on the doors don’t meet the spaces in the door frames. Like everything in Virginia, it’s old, which is part of its charm. But its shifting and settling has left narrow, disconcerting margins of air at the edges of every room. I look down at the molding that hovers slightly above the wooden planks, and I get uneasy. I feel exposed, slightly out of control. What will it let in? Isn’t its job to protect me? Keep me safe from ants and spiders, stink bugs and mice and, oh my god, a word I can’t even type… sn@$es!? I am falling in love with my little Virginia cottage. Yet when I talk about its charm, I feel the need to add that the water goes completely off for 12 seconds every eight minutes, that I can only unlock my front door if the weather is warm, and the whole house rattles ever so slightly when a train passes down the hill. Why can’t I just say I love you, and leave it at that. This morning while brewing lemongrass tea in my kitchen where the stove misses the cabinets, I was mulling over my discomfort when Cake’s words belted out of the living room like a saucy ultimatum from my house. I still feel oddly off balance. I want Mike Holmes to show up with all his Holmes on Homes bravado and a fleet from Home Depot to mend my open spaces and make everything alright. I want to wrap up my house in a tidy little raffia knot so I can rest easily on my couch, undisturbed by the unexpected. How many things have we held at arm’s length because they didn’t fit? People we rejected, opportunities we let slip past, even small daily gestures of kindness we didn’t accept? How many things never got started because we couldn’t commit to the discomfort of the open space? When I was in the desert trying to make sense of my life, I came up with a theory about this, based on a few years of childhood ballet. Bras Bas technically means “arms low” and is the dancer’s ready stance. When you stand in Bras Bas, your arms are poised yet relaxed, curving low against your hips, fingers not quite touching. Bras Bas is a ready resting. I left for my desert odyssey with a question in my pocket: What does feminine strength look like? Bras Bas offered me an answer. It is strong and soft, gently curving, inclusive. Its arms encircle us, leaving an opening to move through. It stands comfortably empty, receptive to what will come. When I stand in Bras Bas, my body understands what took years for my mind to find: to be whole, I must honor the part of me that receives and that can shift with grace when the unknown enters. We’ve built walls of fear around us in anticipation of a life of war. But there is another way: intentional surrender. Soften into being. Have strong arms but let them rest next to you, at the ready. Empty yourself to receive. And leave room for the gifts of your life to bloom through the open spaces. When the student is ready, the teacher will appear. My teacher showed up as a charming little cottage in Virginia, resting in Bras Bas, strong and relaxed against the garden. Its edges do not meet. Kassie, I love this piece so much. I totally relate to the house not fitting. My dining room, and the room above it, both slope so dramatically that items fall off the tables next to the walls. And yet, I think this teaches me about balance. It reminds me not to take anything for granted. And I love “bras bas.” That is very similar to the position the Buddha recommends the hands and arms to be in seated meditation: forward, forearms touching the crossed upper legs, the hands lying face up, one on top of the other, with the thumbs meeting, as if gently cradling an egg (waiting to crack open?). Nerissa, Balance is such a beautiful house lesson. Our environment (especially our home) represents our base, our root chakra. And so often we don’t give it the attention it deserves. I think it would be a wonderful exercise to observe ourselves and life through the lens of our home and see what it might have to say. And I love the idea of gently holding what is waiting to crack open. Thank you for that vision. Makes me think of that coaching exercise that you gave me, Nerissa, years ago: you asked me to write about my house. You didn’t tell me why, but, afterward, as Kassie suggests, we found that my space had a lot to say about how I was moving through life and what I was seeking to learn! Lovely piece, Kassie! Hey Ashley, it sounds like you learned a lot from your home – as I am from mine. Our environment has so much to teach us, whether our house or office, our town, state and country, or the land itself – they are all choices we make that reflect something of us in them. I love the exercise of looking into the mirror of your house and seeing what’s reflected back. It would be a great accompaniment to this post. Thanks Ashley for sharing that with us. I love your site! 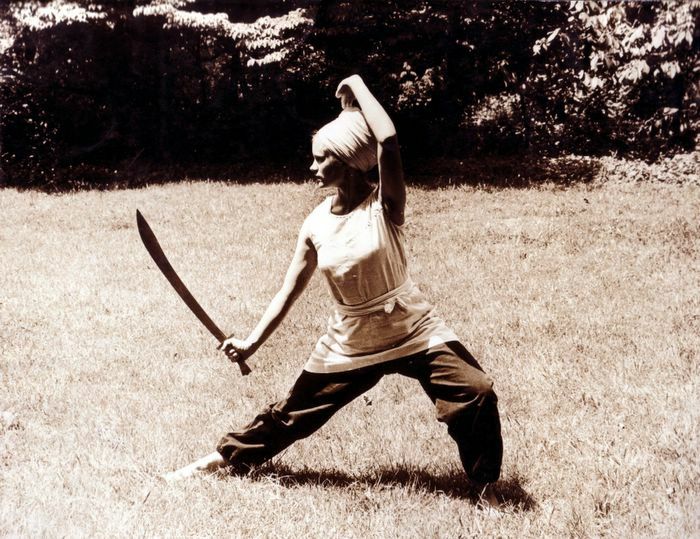 Your passage about bras bas and feminine strength reminded me of a picture I recently came across of a Sikh Khalsa. When I look at her I feel calm, grounded, beautiful, and strong. Thank you! It’s been fun to explore and interesting to see what questions inspire me to write and move others to join in the conversation. I hope you’ll keep sharing your thoughts. AND, I love your photo of Sikh Khalsa. I took a workshop on conscious embodiment with Wendy Palmer who runs Embodiment International in San Francisco. She has created a somatic school of being out of her work as a black belt in Aikido. To stand wielding a sword over head and ‘dance’ with another person in the martial arts was one of the most powerful, embodied memories I have. Thank you for reminding me of it with your photograph. You’ve inspired me to get back out to California and take more classes with Wendy! Thanks for writing and sharing your thoughts. Come back for a chat! What great insight and so beautifully written. Your words have given me things to think about. Thank you, Allison. It’s been interesting putting ideas out in public like this. It’s like having the great meaty girlfriend conversations but with so many more voices and with much greater reach. Please share if something comes to mind – either through the blog or via email. We’re all learning from and with each other. Oh, Kassie. To read this passage reminds me of the journey my life has taken me on over the years. From Winchester, to Charlottesville, to San Francisco, back to Charlottesville, and many, many homes. The soul-searching, the comfort of “home” (or not). I can’t wait to see you now that we’re both here in Charlottesville. You are an amazing writer. Can’t wait to read the next blog posting. Rebecca! Thank you for sharing a slice of your own story. I am amazed by the beauty and strength that come out of the toughest journeys. I’m excited to see you now that ours have brought us together again back in Virginia. We have a lot to talk about! Thanks for reading and please keep sharing. I hope to have many voices speaking here. We all have so much to say. Dear Sharon ~ you are the epitome of beauty and grace. I’ve missed you and the Salon Circle and hope to band together a powerful group of women here in Charlottesville to see what will emerge from the collective. Please send my love and blessings to everyone. Kassie, I certainly didn’t teach you to speak…..but I listened a great deal……and all that I heard in the past, leads me to say, I am so proud of you. You have found your “authentic” voice and it is SOOOO beautiful, lyrical, visual, spiritual and oh so brilliant. You were always that…..but your experiences and life’s lessons have helped you to dare to share your profound questions, thoughts and sometimes humble yet wise answers. What you share does and will, make a difference in the world. Keep writing what you love. Dear Ilona, thank you so very much. To do what we love is the only real path toward the answers we seek. And at some point, the need for answers falls away and we are left traveling with the love. To have a taste of that is enough to keep me writing, even on the days where chocolate seems like a much better road to happiness. I hope you will share your thoughts with all us as we travel this journey together. Thank you, Carrie. You sound so powerful when you say ‘YES I can.’ And you are!